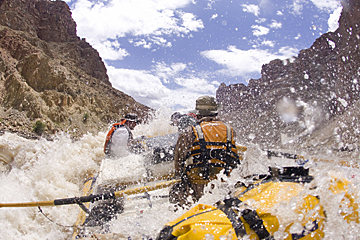 Whitewater rafting in Cataract Canyon in Canyonlands National Park, Utah. O.A.R.S. adventure travel company is operating rafting trips into October. Veteran river outfitter and nature-based adventure travel company O.A.R.S. (www.oars.com/) is operating rafting, hiking and multi-sport vacations into October that promise cooler temperatures along with great fishing, uncrowded wilderness and brilliant night skies. The company’s four-day, lodge-based Grand Canyon Rim to River Hiker in September and October brings guests into one of the deepest parts of the Grand Canyon with an overnight stay at historic Phantom Ranch. The adventure begins in Walnut Canyon, en route to the South Rim, with a close-up view of 25 unique cliff dwellings. Hiking in Wupatki National Monument, features multi-story ruins of red sandstone blocks and mortar. After gazing into the canyon’s depths from the Desert View Watchtower, a night at the South Rim is the perfect spot to rest before an invigorating hike into the canyon the following day. The South Kaibab Trail, a seven-mile hike into the canyon, reveals panoramic vistas that overwhelm the senses as guests take in the canyon’s grandeur. The Bright Angel Trail offers a nine-mile hike out of the canyon, followed by a short stroll along the Rim Trail to Hermit’s Rest before returning to Flagstaff on the final day of this hiking adventure. The rate is $1,599/person based on double occupancy. The Colorado River through Cataract Canyon serves up ideal conditions for hiking to scenic viewpoints and pre-Puebloan sites, stand up paddleboarding in the flat water and Class III whitewater through the heart of Canyonlands National Park in Utah. By September the scorching heat of the summer has faded, and with the sun a little lower in the sky, the shade created by canyon walls produces mesmerizing oblique lighting and wonderful opportunities for photography. Guests can marvel at million-year-old rock formations as well as ancient pictographs & petroglyphs while hiking side canyon trails. Four- and six-day trips through October start at $1529/person. On a special September 14 “Stars with Lars” astronomy trip, veteran O.A.R.S.’ guide Lars Haarr will help interpret the night sky that offers some of the best conditions for stargazing due to the remote location and absence of city lights. For more information, availability, reservations and a copy of the 2014 O.A.R.S. Adventures catalog call 209-736-4677 or 800-346-6277, email info@oars.com, or visit www.oars.com.